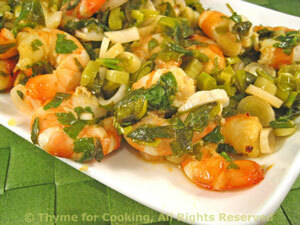 Shrimp with Green Sauce, Mascarpone Chicken, are some of the main courses this week. OR trim the green onion the same way and slice; mince the garlic. Chop the parsley - I cut with a scissors. Mix olive oil, lemon, chopped parsley and green garlic (or onion and garlic) in a medium bowl. Put into a small baking dish and bake, 400F (200C) 15 minutes, until shrimp are just cooked through. I occasionally find a chicken recipe that leans more toward the decadent than the healthy and reserve it for a Saturday dinner (rather than a Monday). This is loosely based on a recipe I saw years ago in Cooking Light magazine. I cut the chicken breasts in half, but you can leave them whole if you prefer. Mix mustard, vinegar, wine and thyme. 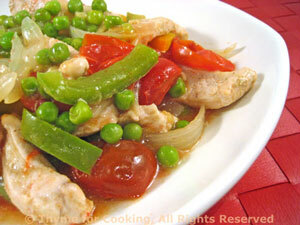 Cut chicken breasts in half, the short way, and put in a small dish or larger zip-lock bag. Add mustard mixture and allow to marinade for at least 10 minutes, but up to an hour. Peel shallots and garlic, leave whole. Heat oil in nonstick skillet. Add Prosciutto, shallots and garlic. Sauté over medium heat until all is slightly browned, about 10 minutes. Remove chicken from marinade and add to skillet. Reserve marinade. Add the reserved marinade, parsley, bay and chicken stock. 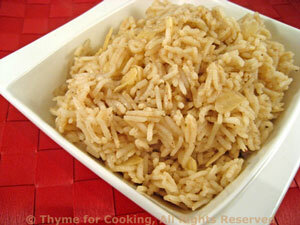 Stir to combine, cover, reduce heat slightly and simmer for 20 minutes. Remove chicken, shallots and garlic to a small platter and keep warm. Dissolve cornstarch in water. Stir cornstarch into stock to thicken. When hot and bubbling again, turn off heat and add mascarpone, stirring well. Spoon sauce over chicken and shallots, serve. Use any cheese you like for this. 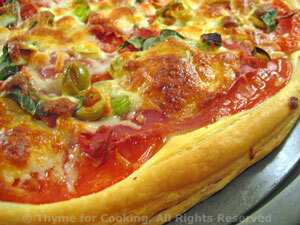 The puff pastry makes a light and flaky crust and the pizza is ready in no time! Trim and slice green garlic, using the green as well as the white. Sprinkle with green garlic, marjoram, olives and cheese. Sprinkle with Parmesan just before slicing. The flavors of orange, sherry and paprika combine to give a taste of Spain to this easy salad. I cut the breasts in half, the short way. They cook a bit faster and it makes a nicer presentation with the salad. Mix flour, paprika and cumin. Cut chicken breasts in half. Roll in flour mixture to coat. Heat a large nonstick skillet. When hot, add oil, chicken and brown well on both sides. Add orange juice, white wine, cover, reduce heat and simmer 10 minutes, or until done. Sauté in olive oil until tender. Add sherry vinegar. Keep warm. Pick through the spinach, discarding any wilted or damaged leaves. Wash, spin dry if necessary and put into a large bowl. When chicken is done remove and place on a platter or 2 plates. Turn heat up under the chicken skillet and reduce liquid by half. Remove from heat and add the peppers and shallots. Spoon over the spinach. Toss well to coat and wilt spinach slightly. 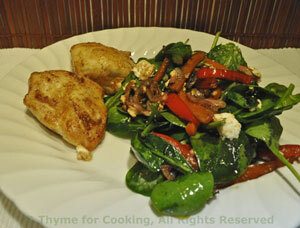 Arrange spinach next to the chicken. Crumble feta on top and serve. Spain, like most countries with a warm climate, grows and eats lots of peppers. In Andorra I used long, green chilis. Now I make do with bell peppers. Use hotter peppers if you prefer. And the olives? They're everywhere! Slice onion about 1/8" thick (.3cm). Cut pepper in half the short way and then into slices, 1/4" thick (.6cm). Heat oil in medium nonstick skillet. Add onion, pepper, carrot and sauté 8 - 10 minutes. Add garlic and sauté another 2 minutes. Slice pork into rounds about 1/2" (1cm) thick. Add to skillet and sauté 3 - 4 minutes per side, or until done. Return vegetables to pan, add olives, herbs, wine, stock and vinegar. Stir to combine. 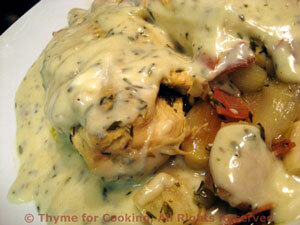 Cover, reduce heat to low and simmer 5 minutes to blend flavors. Uncover, remove pork to small platter. Increase heat under skillet. Add cornstarch mixture and stir to thicken. 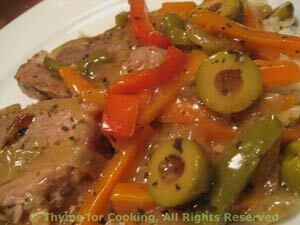 Arrange vegetables next to pork and serve.